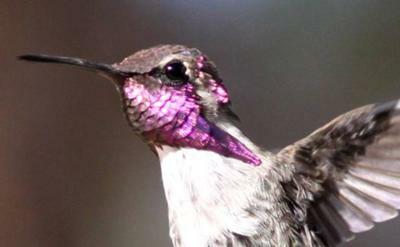 Taking pictures of Hummingbirds, (and other feathered friends) is a passion of mine. But every year about this time the bees finally start to take over the feeders, and I have no clue what to do about it. Someone suggested some sort of insect repellant but most of those are hazardous to the little ones. 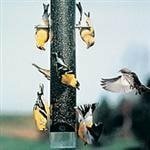 I tried wiping down the tops of the feeders with a wet dryer softener sheet, it seemed like it was working but then to my dismay, they just didn't care and swarmed the feeders anyway. Funny thing is, I even have grape jelly out there for the Orioles and they don't even TOUCH that! Sometimes the hummers will sit and lick the jelly though. 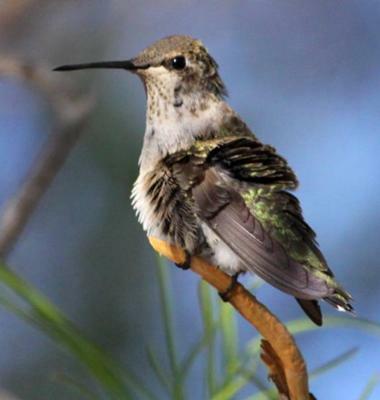 My little hummers come and just sit on the branch as if to say where is our feeder? We couldn't even walk outside because of the amount of bees swarming those things. I have hummer flowers out there but its just not the same. I hung a feeder out there last night in case they had the chance to drink at night, but this morning at 5:30 the bees were starting to come again, and I had to reluctantly take them down again. 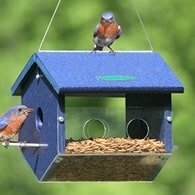 Feeders with bee guards don't work, because when the bigger birds get on there, they spill the nectar so the Bees just come and lap it up. I am so desperate, not to lose my little friends. Does anyone have any ideas? Please? Comments for BEES! Invading Feeders, Ideas? Some of the suggestions here are really bad for the humming birds. Any type of oil may ward off bees but it can also stick to the feathers of the tiny birds and cause problems with their feathers. Don't use nail polish to paint the yellow...that is toxic to the hummers. You can however, use non toxic paint to cover any yellow. You can google this information online...that was how I learned about it. To help with the bees.....In the past, I have used plastic Coke bottles. (yeah, I know, plastic is bad for the environment but it works great for this) Just recently, I found out that they (bees/wasps) really like the color yellow, so now I will find a bottle of soda that has yellow to help attract these hummer invaders. Keep the label on. Take a knife or something sharp and poke holes in the top portion of the bottle. Being careful not to cut yourself in the process. Leave about 1/4 of the yellow soda in the bottom and add Dawn dish soap. Maybe about a teaspoon. Put the cover on the bottle and tape it to something/somewhere. Most of the bees will go after that instead of the hummer feeder. When it gets full of bees or to gross to look at, throw it away. You can experiment but it works great!!!! The solution I have found to bees and wasps at your feeders is to dip your fingertip in cooking oil (I use coconut) and just spread it around the edge of the hole, being careful to just put a film of oil on. 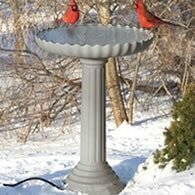 My feeders have glass bottles with red feeder attachments that have flat tops. It's really easy to do this. You will not have bees, wasps, ants, or any bugs at all. It does not bother the hummers at all since you are not getting it into the sugar solution. Bugs may try, but will immediately give up. 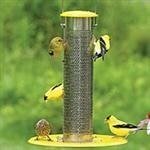 Another tip, for what it's worth, is to make sure your feeders don't have yellow. Yellow seems to attract the bees more. Use nail polish to cover the yellow. 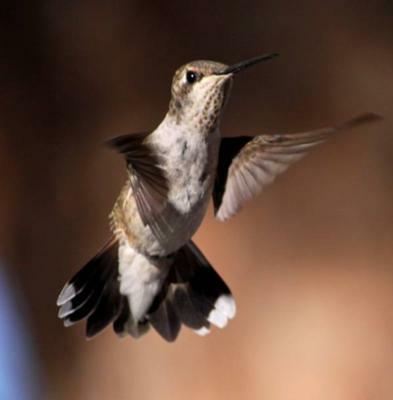 You can try mixing a saucer of extra sweet sugar water for the bees and see if you can slowly move it farther away from your hummingbird feeders. Just some ideas, maybe what you're doing is all you can do. Thanks for your contribution. Thank you for the compliment on my pictures! I have literally over a thousand!! and That is no joke! Several different species. I am home bound most of the time due to illness.. and the hummers give me so much joy. 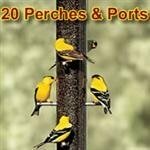 as do some of the other migratory birds that stop by every year. And then there are my state birds. Hanging the feeders in the shade brings no relief. I am at a loss. 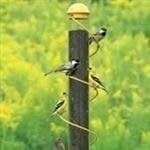 I have been hanging the feeders at night, because the bee's don't seem to come till just before sunrise. I hope they get used to that. One thing we do not have here, is a shortage of bees Marian. I have seen some of your comments in the past. We have a lot of Desert willows around us and that may be a source. We try to keep them cut down.. but they grow where ever the pods are blown! BEAUTIFUL, stunning trees they are, absolutely GORGEOUS, but they are a tree for bees to the hilt! Maybe you could ask around, and see if anyone you know.. has been successful.. with some sort of safe product for the birds.. but one that keeps the bees away? 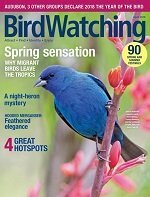 Hi, I just love your hummingbird photos! 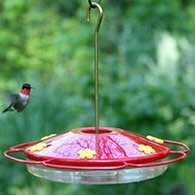 I can feel your frustration as you write about how important it is to have the hummingbirds at your feeders. I also know that there is concern about the dwindling bee population, so you might consider this a mixed blessing. I do hope somehow things will work out for both the bee and the birds! 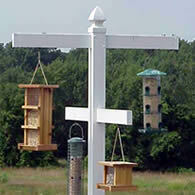 Try placing feeders in shade and providing several feeders. Good luck.